Based on the work of Art Nouveau pioneer Alphonse Mucha (1860-1939), “Art Nouveau-Spring” is the second in the series depicting the four seasons of the year. Shown against a sun-drenched background, the woman is holding flowers, the symbol of the harvest. She is framed with a classic Art Nouveau design, which forms the border for this work. Mucha was one of the leaders in the movement, which spawned some of the most recognizable artwork ever created in the last century. A native of Czechoslovakia, Mucha learned his art while living in Paris. There, he created several Panneaux, a series of works centered on a single theme, including “Art Nouveau-Spring”. Woven in chenille, this piece is summer personified. 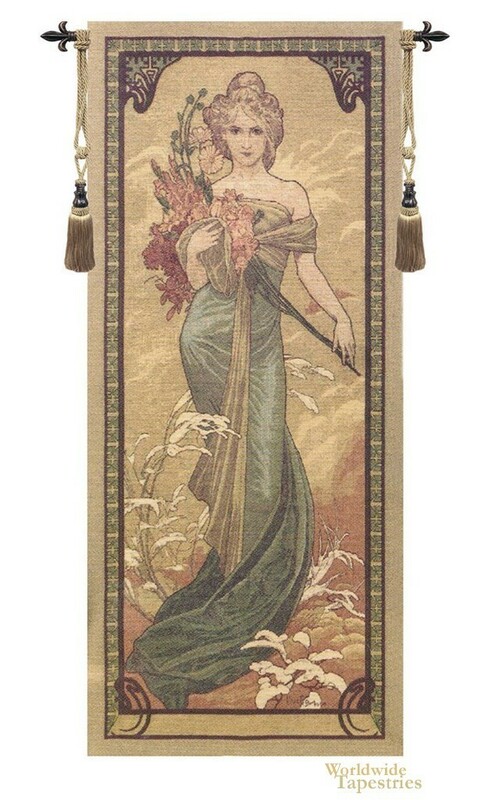 This Art Nouveau - Spring tapestry comes unlined and has a tunnel for easy hanging and display. Note: tapestry rod and tassels, where pictured, are purchased separately.